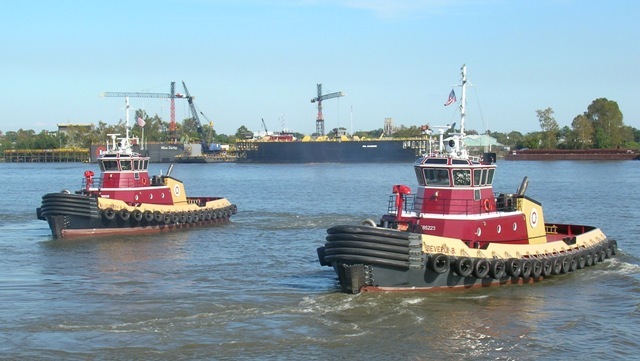 (NEW ORLEANS; Jan. 5, 2011) ­– Two Jensen Maritime-designed tugboats, the Elizabeth B and Beverly B, were commissioned into the E.N. Bisso & Son Inc. fleet during last month’s WorkBoat show in New Orleans. The tugboats, which measure 96 feet in length and 34 feet in beam, are the fifth and sixth hulls of this class of tugs to enter service with Bisso. These Rolls-Royce US205MK2 Z-drive tugs are powered by twin Caterpillar 3516-C Series II main engines that produce a total of 4,000 BHP – driving Rolls-Royce-built Ulstien-Aquamaster 205 units – and are fitted with a Markey hawser winch forward and a Markey capstan aft. Seattle-based Jensen Maritime Consultants, Inc., is a naval architecture and marine engineering firm owned by Crowley Maritime Corporation. The company offers a diverse range of consulting, design and engineering services developed from 50 years experience working around the world. Jensen is a recognized leader in the design of all types of vessels – particularly work boats, fishing boats and passenger ferries – and has built a favorable reputation on a long history of successful designs and conversions with close attention to engineering basics. The company’s services include detail and conceptual design and engineering, lofting, regulatory and shipyard liaison as well as on-site consulting services and on-location assistance anywhere in the world.